Yoga is a form of meditation and exercise, that has become very popular among millions of individuals today. Yoga is practiced for its health, physical and mental benefits, and features mainly breathing control, meditation, and specific body positions. In general yoga is practiced barefoot, but in some cases Yoga shoes may be required or sough after. During your work out you want the best in comfort and flexibility from your Yoga shoes. Whether you have been practicing Yoga for a long time, or are just a beginner, the right Yoga shoes can make a huge difference to your overall experience. Yoga shoes can help to improve your flexibility and balance, and aid in aligning the rest of your body, so that you are able to hold certain poses for much longer. If you do not wear Yoga shoes that offer the right support you may end up with injuries, and your Yoga practice may do more damage than good. Yoga is not just a gentle stretching activity, this is a great misconception. Yoga can be an intense form of physical exercise which can cause you to sweat and become quite hot. Thus BREATHABILITY in a good yoga shoe is always important if you do not want wet, or smelly feet after an intense session. So stay clear of shoes lined with polyester and synthetic materials, or rubber and opt for leather, canvas or other porous and breathable materials. Besides this a good pair of breathable and lightweight cotton socks will similarly make a huge difference. Yoga is all about balance and stamina, meaning you will be in certain poses for certain periods of time, which may require good toe grip or spreading. For this reason you do not want your toes to be too cramped, but rather look for a shoe that mimics the natural shape of your feet, particularly your toes. Neoprene is one of the best materials to look for that will improve your grip. I would highly recommend investing in a no-slip technology shoe if you are interested in more advanced and inverted yoga positions and techniques. So you may feel you are more comfortable practicing Yoga bare feet, well in reality you are just opening yourself up to discomfort, potential injuries, improper alignment and also, bacterial infections. If you are looking for a more minimalist and natural feel, Yoga Socks, are a good option to consider. Yoga Socks are breathable, fit like socks, and provide excellent grip. Another excellent choice is the Hybrid Option, which expose the tops of your feet almost like sandals, but individually wraps each toe and tie at your ankles. These shoes are comfortable, versatile and highly improve your form. A durable rubber or non-slip Outsole. Cushioned EVA, Foam or Gel footbed or midsole. It has an elasticated heel strap or closure. Mesh, leather or natural fabric uppers that are lightweight and breathable. The Sanuk Sling is a very comfortable and cool thong sandal with a yoga-mat footbed and soft textile uppers which makes it great for yoga practice and meditation. Pure 100% textile uppers that are soft an comfortable against your feet, in a thong style. A durable and thick, supportive sole with a padded yoga-mat footbed, for comfort and support. Available in one Neutral Black color option. For that completely natural Barefoot feel without the risk of slipping, these Yoga socks give you the perfect opportunity and freedom, along with excellent slip resistance. Manufactured from quality Premium Cotton with silicone gel grips at the bottom and elastic straps. A ballet inspired style Yoga sock with a feminine low cut and elastic straps for accentuated style and a comfortable fit. A gorgeous ethnic pattern at the bottom of these Yoga Socks make up the anti-skid, non-slip gripping sole.Moisture-managing design that permits better airflow to keep your feet dry and fresh. 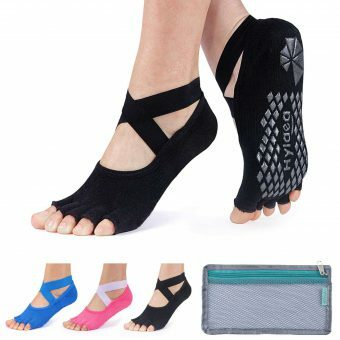 These are similarly a pair of Yoga sock style shoes that are also used in ballet, for a more barefoot and natural experience without the slips. Made from premium materials with a lightly padded foot and silicone sole. Wear and water resistant as well as completely skid proof. The Natural toe Microfiber leather absorbs sweat and is much less bulky, keeping your feet dry and comfortable. The non-slip features enhance stability and help you to keep your balance easily. An instep with holes that is flexible, breathable and very easy to use. Foldable for easy storage and portability. Available in many feminine and colorful design options for your perusal. The Vibram VI-S is a tough and flexible Yoga shoe, which characterizes the sough after Vibram rubber outsole for the best grip. Available in many fun and colorful colors and print options for your own personal style preference. 100% Pure Quality textile uppers with perforation holes for breathability. A Form-Fitting front that encapsulates every toe with an open design and closed protective heel. A stretchable and highly adjustable closure system, that has an easy release system. The serrated blade lug design outsole, offers good grip and is manufactured from pure Vibram rubber. Features a zero drop design for better balance and stability. Easily machine washable and quick air drying. Completely flexible and comfortable on your feet. I love these water shoes, they have the perfect design to use for a variety of exercises, including water sports and Yoga. Flexible, breathable, and good gripping rubber, what more do you need in the ideal Yoga shoe. These shoes are available in so many delightful and funky designs and prints, as well as solid color options for kids, men and women. Outstanding appeal and genuinely comfortable water shoes. Versatile enough to use for many occasions and sports or exercises including yoga. Ultralight design that is flexible and compressible for easy storage and portability. Features a top[ quality rubber outsole that protects your feet from sharp objects and offers good grip even on wet surfaces. Excellent shock absorbency and cushioning with a separate protective toe. Made from light, quick drying, and highly breathable Polyester and Spandex materials.